The Turkish defence contractor Savunma Teknolojileri Mühendislik ve Tic. A.Ş. 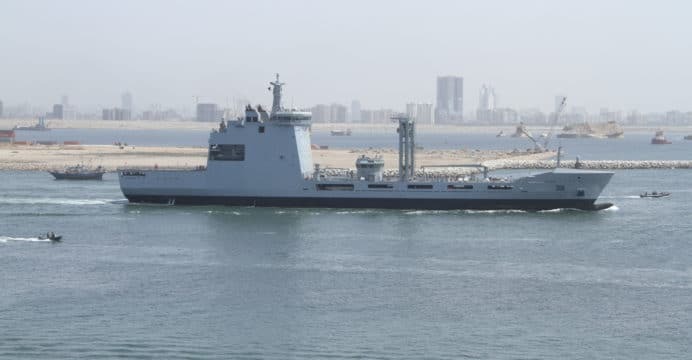 (STM) announced on 07 April that the Pakistan Navy Fleet Tanker (PNFT), which was constructed with STM’s support and material kits from Turkey at Karachi Shipyard & Engineering Works (KSEW), completed its first long-range survey mission in the Indian Ocean on 31 March 2018. Pakistan formally ordered the PNFT in January 2013. The steel-cutting ceremony took place in November 2013 while the PNFT’s keel was laid in March 2014. It was launched for sea-trials in August 2016. The Pakistan Navy (PN) christened the PNFT as the PNS ‘Moawin’, i.e. officially replacing the ex-Dutch Poolster-class tanker which had originally bore that name since 1994. According to the PNS Moawin’s ship designer – i.e. Delta Marine – the 15,600-ton tanker (16,400 full-load) can carry up to 8,650 tons of F-76 fuel, 210 tons of JP-5 fuel, 1,050 tons of fresh water and dry cargo of up to 650 tons. It has a ferry range of 10,000 nautical miles at a speed of 15 knots. The PNFT’s helicopter deck can support day and night operations along with vertical replenishment, while the hangar can support one Sea King helicopter and one Z-9EC helicopter. The PN has also equipped the PNS Moawin with the Kelvin Hughes SharpEye I-band Doppler radar as well as E/F-band Doppler radar along with supporting internal equipment (e.g. widescreen displays). According to Kelvin Hughes, the SharpEye can detect low radar cross-section (RCS) targets under normal and adverse weather conditions. The SharpEye is also equipping the PN’s Agosta 90B submarines. The PNFT was one of three PN programs being managed by STM, the others being the mid-life-upgrade of the PN’s Agosta 90B air-independent propulsion (AIP)-equipped submarines and an infrastructure program involving a hydrographic/oceanographic survey, geotechnical survey and port design. Currently, contracts have been issued for two of the three Agosta 90B AIP submarines. STM has been hoping to secure its largest contract from Pakistan to-date, i.e. a purchase of four MILGEM Ada anti-submarine warfare (ASW) corvettes.